Joan Pons Laplana’s nursing career has not been linear, which perhaps befits a man who believes in ‘horizontal power’ and challenges hierarchy. The signs were there 20 years ago when, studying for a degree in critical care in Barcelona, his role model was maverick TV paediatrician Doug Ross, from the series ER. ‘I do not like routine – I like to be challenged. I thought A&E was the thing for me. I wanted to be the next George Clooney,’ he says. Having come to England to work, it was this rebellious spirit that led Joan to a decision that turned his approach to nursing upside down. Joan had moved to work in intensive care. He was assigned to a cubicle where a young man was recovering from a motorcycle accident, unable to speak or move and very depressed. The man asked Joan to move his bed closer to the window – a request Joan knew was strictly against health and safety rules, but which he granted. The patient and Joan sat in silence, in tears, hand in hand for 20 minutes while sunlight streamed through the window. It was a turning point in Joan’s career. The following day, Joan was called into the matron’s office and given a formal warning. Disillusioned, he left the job and spent two years working as an agency nurse in Yorkshire. In 2012, he secured a community nurse job with Derbyshire Community Health Services (DCHS), where he met Sally Edwards, a manager who shared his vision of patient-centred care. Things took offfrom this point. Following the launch of the 6Cs Joan became a ‘care maker’ and is now Midlands regional co-ordinator. In November 2013 he became East Midlands NHS Change Day co-ordinator and recently joined the board of directors of Health & Care Voices, a forum where professionals can share views on health and care. ‘In less than two years, I had gone from being nearly unemployable to winning multiple awards,’ he says. He was asked by Ms Edwards to join the NHS Employers campaign and become a champion in charge of equality and diversity for DCHS. Together they created a BME network in DCHS, making it mandatory for all staffto watch a 15-minute video about diversity and equality at their induction. 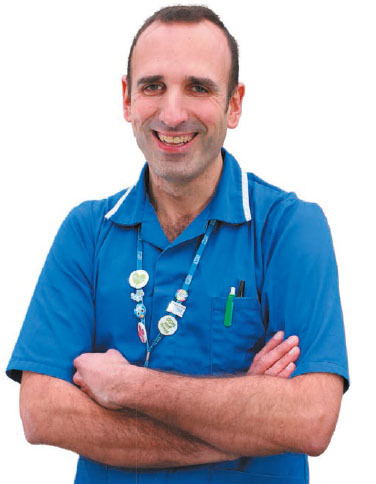 Now working as a BUPA IV therapy charge nurse in Chesterfield, Joan was shortlisted for the NHS Employers Excellence in Diversity Awards 2015 for his work as a nurse ‘going above and beyond the expected’. Joan says: ‘Diversity should be at the centre of any organisation. It should be about delivering a high standard of care’.